The Children’s Rosary continues only through the generosity of people like yourself. We try to do a great deal with very little. We would like to share with you how your donation makes a difference. A donation of $25.00 helps us share enough materials for a new small Children’s Rosary group to form in the United States. A donation of $50.00 helps us send enough materials for a small Children’s Rosary group to begin in a foreign country. 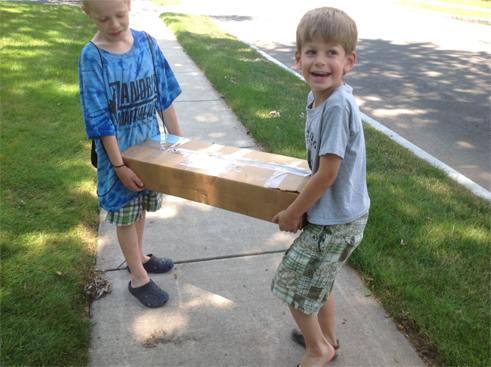 As requests internationally are usually for large groups, $125.00 allows us to send enough materials for 75 Children to have enough materials to begin a group and each child to have a Rosary. 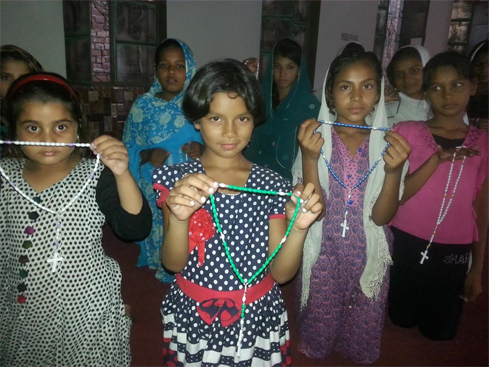 Smaller donations of $5-$20.00 allow us to put together a missionary package to hand deliver to a person traveling to a distant area of the world to help begin Children’s Rosary groups. Larger donations of $1,000 or more help us meet the demands of materials from missionary outposts where 15-20 new groups are requesting materials. The two groups pictured above were both able to form as a result of donations. We also made our materials available free of charge to the Xavier Society for the Blind. 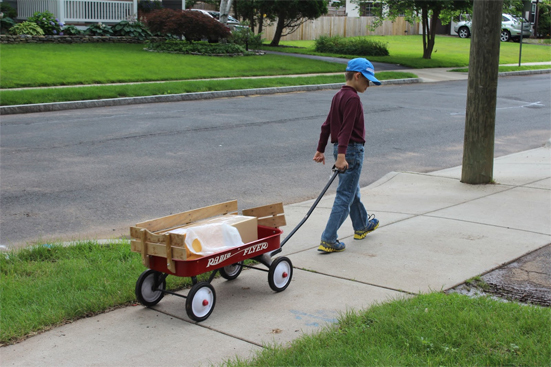 They in turn provide the materials free of charge to blind individuals that request them. The Children’s Rosary is a non profit organization with 501 (c)(3) status through the IRS. All donations are tax deductible in the United States. Recurrent monthly donations however small are particularly helpful to continue the work of the Children’s Rosary. The children are involved in every part of the Children's Rosary. They pack and carry packages to the post office for destinations around the world. The Children’s Rosary is a grassroots organization so it is through your help that new Children’s Rosary groups continue to form. Children are open to prayer but they need an invitation. They need adults to help start groups in their parishes. Learn more about starting a group in your parish: HERE. Larger boxes of rosaries and materials the children carry by wagon to the post office. We are always in need of rosaries. If you are an individual or group of individuals who makes rosaries we very much would appreciate donated rosaries to share with our groups. We also accept used rosaries or store bought rosaries. Please do not send broken rosaries. • Going on a pilgrimage - order our Children’s Rosary DVD to play on the bus and request 100 pack of our Children’s Rosary bookmarks to share with your fellow pilgrims or those you meet. • Order a 10 pack of our Children’s Rosary Books which explain how to begin a Children’s Rosary prayer group and also how to pray the Rosary and keep one in your pocket. Say a prayer that the Holy Spirit will guide each book into the hands it was meant for and bring beautiful fruits. See how fast the 10 go! • Obtain permission from your pastor to leave out information about the Children’s Rosary such as our bookmarks or Children’s Rosary books in a special area of your Church or Adoration chapel. • Contact us about ordering larger quantities of our Children’s Rosary books or our bookmarks to give away. Discounted pricing available. • Sign up for news and updates at the bottom of the screen and share information with friends and family. * Contact us at info@childrensrosary.org or call us at (860) 785 3340 with questions or for information about obtaining our bookmarks, bumper stickers, sample flyers, or large quantity pricing of our materials. THANK YOU! One of the most important ways you can help the Children’s Rosary is to pray. Please include the Children’s Rosary, the members and the intentions of the Children’s Rosary in your prayers. • We invite you to say a prayer for specific intentions submitted to the Children’s Rosary on our Prayer Wall. • We also invite you to unify prayers with the children meeting in their groups around the world. The children always pray for those unifying prayers with them. See our VIEW FROM HEAVEN Map to see if groups are meeting now and join your prayers to theirs. Don’t forget to hit the button join in prayer and become a light on the map. Thank you all so much for your help! 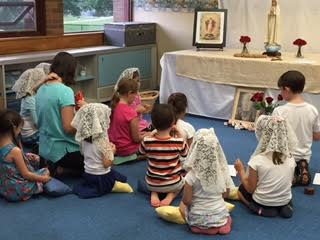 Please know that you are being covered in a blanket of prayers by our Children’s Rosary groups around the world. We ask the children in our groups to pray for all those who help the Children’s Rosary. We also have a monthly Mass offered on the 25th of every month for all the members of the Children’s Rosary and all who help the Children’s Rosary.